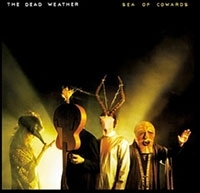 Today, Monday, May 3rd, MySpace is going to stream The Dead Weatherperforming their latest release, Sea of Cowards in its entirety. The band will perform the album front to back in the live room at the Third Man Recordsbuilding in downtown Nashville, the same space in which they played their very first show in March 2009. This exclusive live performance will begin streaming at 3 p.m. PST on MySpace Music as well as the band’s Myspace page. We hope you all enjoyed “Screaming Vinyl Live,” a live, streaming, 24 hour listening party for Sea of Cowards, on Friday. We checked in a few times and enjoyed what we saw. Did anyone see something crazy that we missed? Sea of Cowards is arriving this week and we are going for adds next week, May 10th & 11th.